No work done on this section yet. www.robosapien.tk - "Unofficial Robosapien Hack and Mods Site"
www.robocommunity.com - "The First and Only Official WowWee Robot Community"
Added a mirror for the aibohack.com IR codes. Robosapien V2 main page is born. 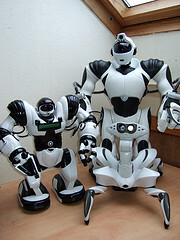 Links to robosapien.tk, robocommunity.com, aibohack.com, robodance.com added.